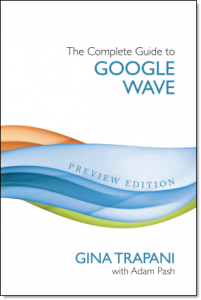 I’m tickled pink to finally announce the project I’ve been hard at work on for weeks now: my new book, The Complete Guide to Google Wave, is now available to read and share for free at completewaveguide.com. Anyone who reads my stuff or listens to This Week in Google knows that I’m a Google Wave nut. Yes, it’s a hyped, complex, do-it-all web application, but the sheer ambition is part of Wave’s appeal for me. Since I logged onto Wave’s developer sandbox back in June, I’ve spent a whole lot of time in Wave, figuring out how it works and what it might do–and blogging about my discoveries just didn’t cut it. So, along with Adam Pash from Lifehacker, I’ve compiled everything we know how to do in Google Wave in a book format at completewaveguide.com. I’m calling it a book, but for now it’s just a web site–with eight “chapters” and two “appendices,” free for you to read, share, and if we’re lucky, help us expand. The site will grow into traditional book formats, however: thanks to the team at 3ones, a PDF version of the book’s preview edition will be available for purchase this month. In January of 2010, a softcover print version of the book’s first edition will be available as well as an updated PDF. Adam and I have committed to four editions throughout 2010, so the book will change and evolve along with Wave. The latest and greatest version of the book will always be available for free at completewaveguide.com. Congrats, Gina!! I’ve been enjoying all your Wave tips here, on Lifehacker, and on TWIG. This is going to be a huge help : ). Rock on! Your new book sounds fantastic. You are my heroine (he wrote carefully) – the best tech writer on the web. Last, but not least, you did a great job on the FOX gadgets & games segment I just watched where I learned why your name was so familiar…founder of LIFEHACKER! Much success to you in the future…geek on! Which Creative Commons license are you licensing it under? The website should probably have that in the footer (similar to Wikipedia). The CC license is in the footer of the site. Congratulations on the book. I love the idea of a wiki style which will allow it to stay up to date. Would it be OK with you if I linked to the page from my blog? I would like to write a post encouraging people to read it. I’m sure it’s no problem, but I would like to be sure. All Hail Gina, Gina rules the waves! Thank you. It should appear tomorrow morning at 8:00AM CST. Your site should get pinged with a trackback. I appreciate it, and the book is good. I have learned a lot from it. I have even worked up the courage to use Wave when getting things together for blog postings. I’ve been following you for awhile, both at Lifehacker and here at Smarterware. You’re an inspiration to anybody who passionately enjoys using software WELL! Congratulations on the book; what a help it will be! Wow. Just wow. I can’t even figure out how to invite people I know to wave with me or whatever.